The Distress Spritzer? well, not REALLY….. This is one of those posts that is a weird confluence of events. Someone once asked me Where do your ideas come from? I thought for fun I would document it – the steps may be unique, but the process isn’t. It’s just the way my mind works and the benefit of a messy desk Feel free to just look at the photos – they should tell you all you REALLY need to know. 1. 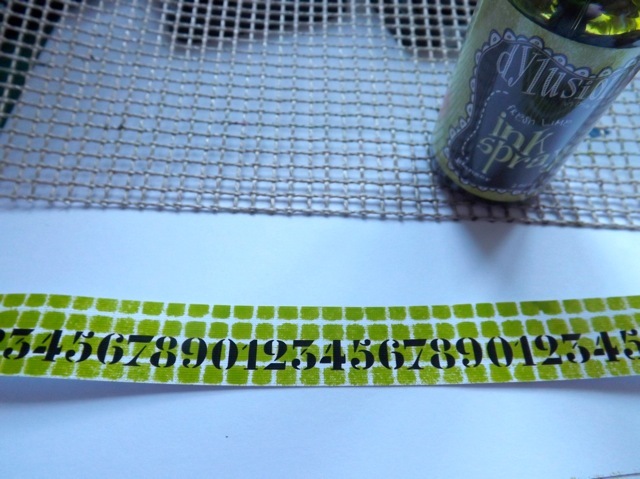 I got an email from a UKS sponsor announcing they had received the new Tim Holtz Distress Marker Spritzer. The more I looked at it the more I was convinced I had one. Not that exact thing, but something pretty similar. So I had a bit of a hunt and sure enough, in with my stamping markers (a drawer not opened since I got my Copics) there it was. This has to be 15-20 years old – I know I got it while in the USA so it would have to be. I had a check for the name and while I see the odd reference to it they no longer sell it that I can find. 2. I popped a few random markers in to it. One thing I can see is that mine seems to be lacking the inner liner for the pen-holder. 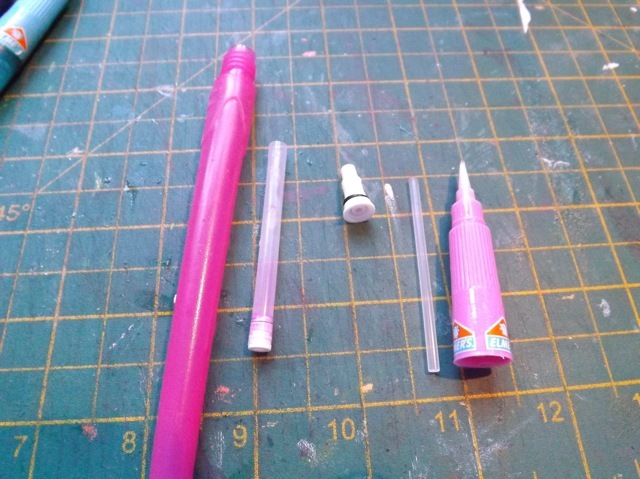 Not a big deal, it works well enough without it but I could always as one of those rubber pencil grips to super thin pens and I bet that would do the trick. 3. 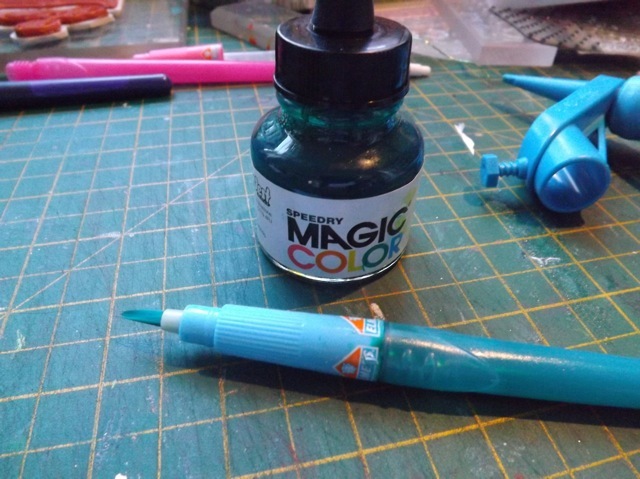 As I was looking across my desk, my eye landed on one of my watercolour brush pens. I thought, I wonder…. Now, I only have maybe two watercolour brush pens. 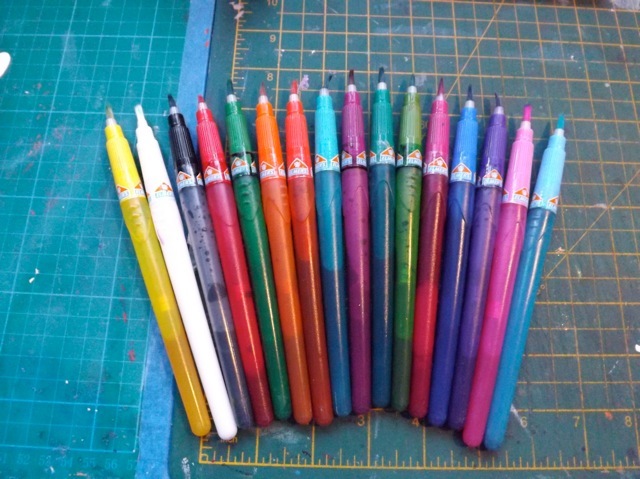 I’ve meant to buy some, after seeing Dyan from Art from the Heart show how she has as many water brush pens as she has colours of Dylusions and she uses them to colour with. But I just never got around to it. Deep in the back of my mind I had a tickle. I KNEW that somewhere, probably in DDs “art cupboard” I had some kids version of the waterbrushes. And guess what? Not only did I have them, I found them. I know we got them maybe 8-10 years ago at Costco. Some of them are fairly empty. I deconstructed one of them, thinking I could just replace the cheap ink with good ink, although I thought as the Dylusions aren’t waterproof either, I might as well just pick one or two of the near-empty ones to play with and use up the rest of the ink with mixed media stuff rather than just empty them. 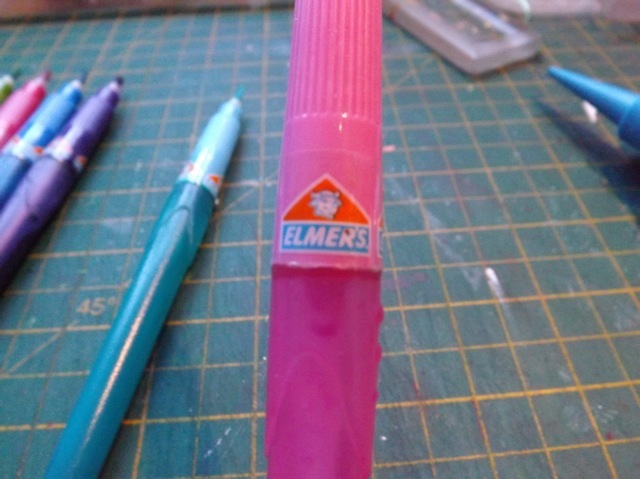 There is no seal on the pens, which surprises me as it’s for the kids market. I would expect them to be sealed and you would need to buy new ones once these ran out. But no, they disassemble just fine. I tossed out the cartridge and the little slim tube. 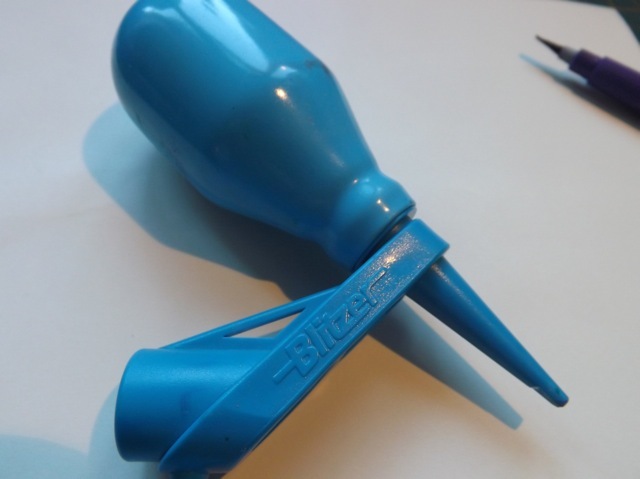 For use with the spritzer you don’t WANT to slow the flow, like you would with a potentially messy pen, with kids, so I binned the cartridge and the tube. 5. And then, of course, there is WHITE. 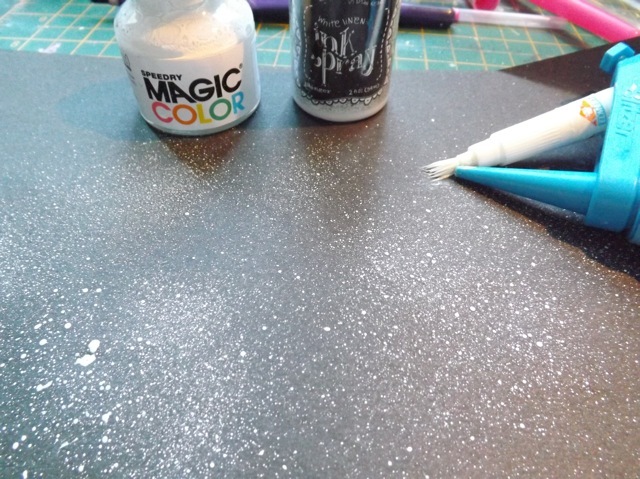 Using the spritzer gives you a way more controlled spray than the spray bottle does, so you would use this for either the Acrylic ink OR the Dylusions for this sort of scatter. So there you go. I’m still in my jammies and my hands are covered with ink and paint, and my stamp-storage tower (with the wood-mount stamps, where the Blitzer was hiding) is pretty much dumped out on the floor, but now I have a new toy to play with, a whole heap of waterbrushes, a bunch of ink to use up, and it’s only just after 9 AM. Or was when I started typing…. And Texas Flood is playing from my playlist, the accident payment has been sent, DH is back from his conference, so no school run, and the house is pretty tidy (well, downstairs, anyway) and the laundry done. Where can the day go from here? Downhill, probably, but I can always hope …. 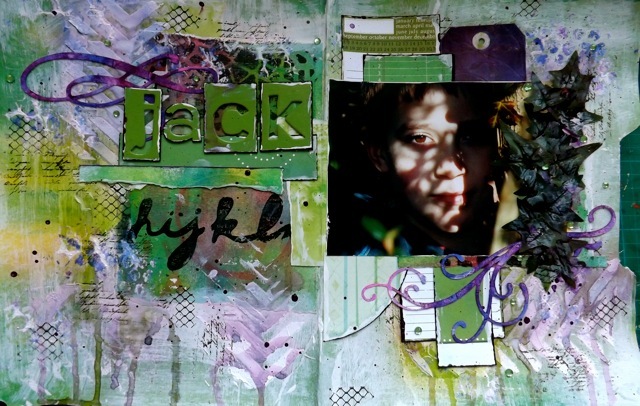 Categories: art journal, New from Old, stencils, tips & finds | Tags: art techniques, how-to, inks | Permalink. After I did the fairly extensive set of reviews of the Cricut Mini and Craft Room, I was told I could keep the machine. 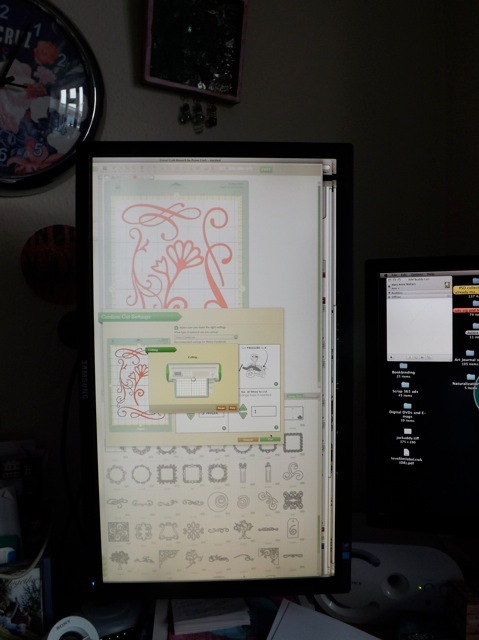 That was a bit of a surprise, as I had already disconnected it and gone back to using my ancient original Cricut. It’s pretty much stayed in the box till now. 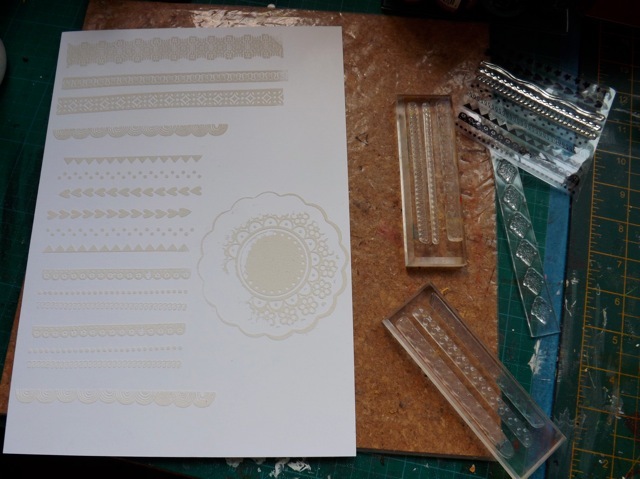 But I wanted a stencil of a particular shape and I thought I remembered there was something suitable amongst the images so I dragged it out again and plugged it in. I’m not going to lie – the process is a little fiddly, but as a few visitors commented they quite liked the resulting stencil I though I would take a moment to explain how I made it, what image I used (and what cart contains it) and maybe give others the idea of how they can create their own unique tools. I know that text is small but at the bottom you can see the cart from the list and the image (circled in blue) and I’ll explain the red items as I go. 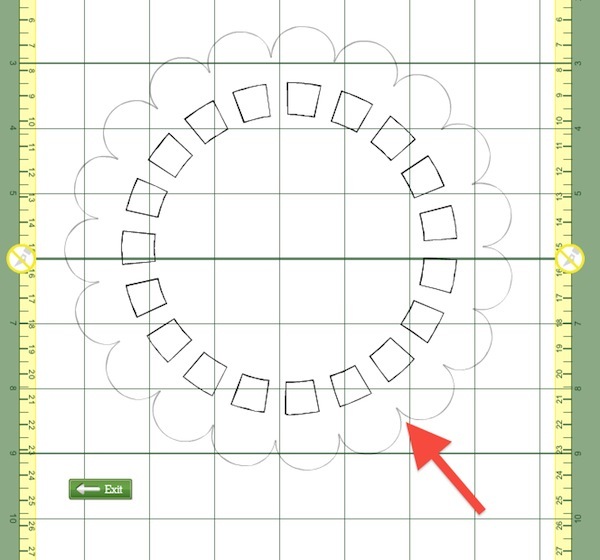 First, open your new file and add the original image – the big blue scalloped circle. That shows you the outline of the image. Anything you click on will be hidden and will NOT cut. 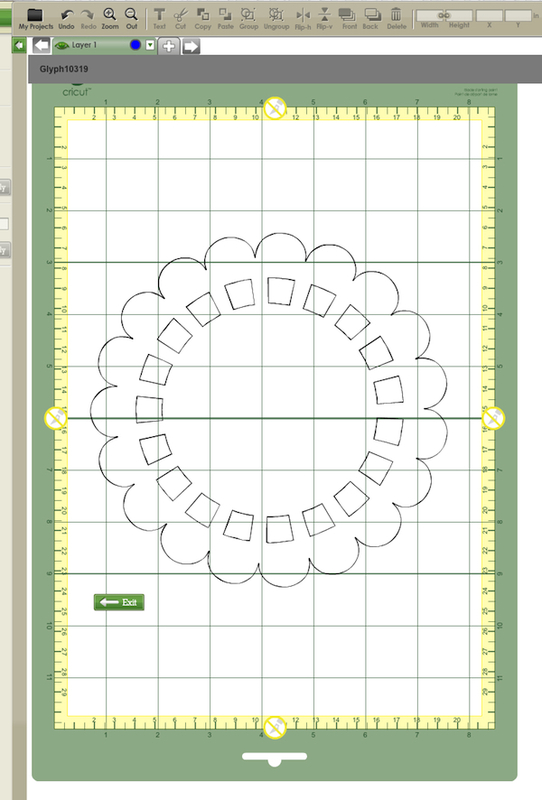 In this case I simply hid the scalloped circle . It grey’s out so you know it’s hidden. The darker lines are the cut lines and the greyed out lines will disappear when you Exit. One complaint I have about Craft Room is the couple of useful commands that don’t appear. Maybe it’s there and I just don’t have it triggered in some TOOL menu or another, but it would be REALLY helpful to have a SCALE option, so you can scale things by a percent. 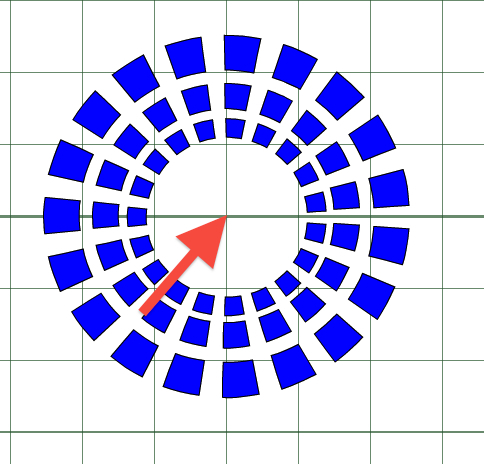 Instead I copy the cut-selection and duplicate it then scale it so the circles nest, by eye by dragging in the corner. The + in the red circle denotes the exact centre of the image. This is critical to line things up absolutely and keep your circle from looking wonky – although that might be the look you want and if so, just line it up off center how you want. 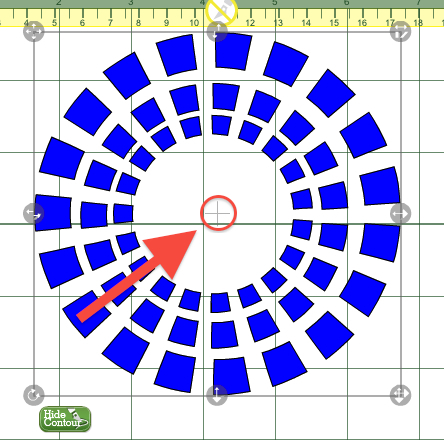 This is where I would LOVE to have an ALIGN option to centre each circle at the absolute middle with a click. 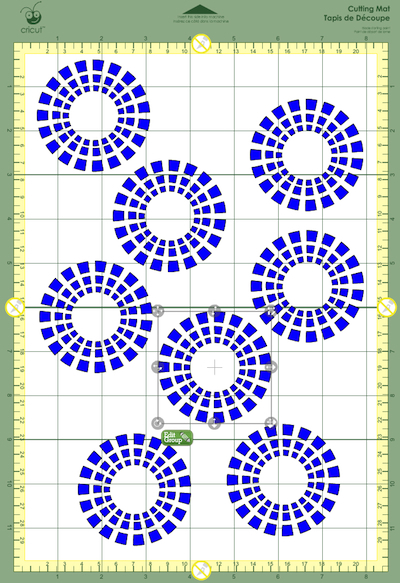 Since I can’t do that, I instead make use of the grid of the mat. 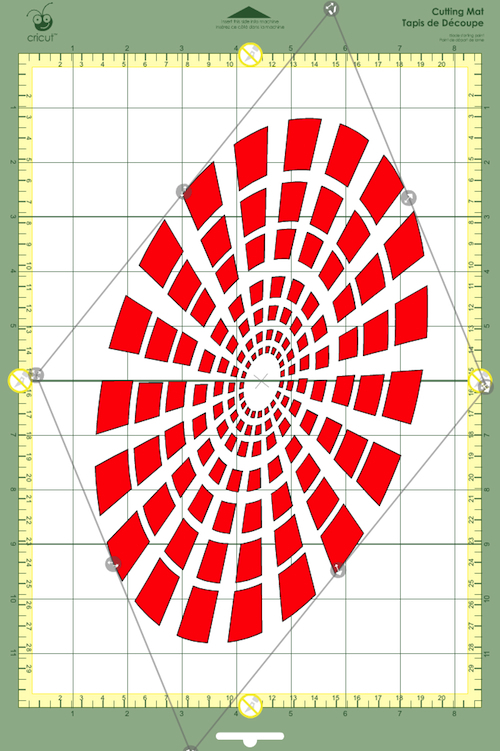 I simply line up that + at a grid-intersection. If you have it lined up exactly, the + will totally disappear, as the lines are thinner that the bold grid lines. Can you get that from this shot? 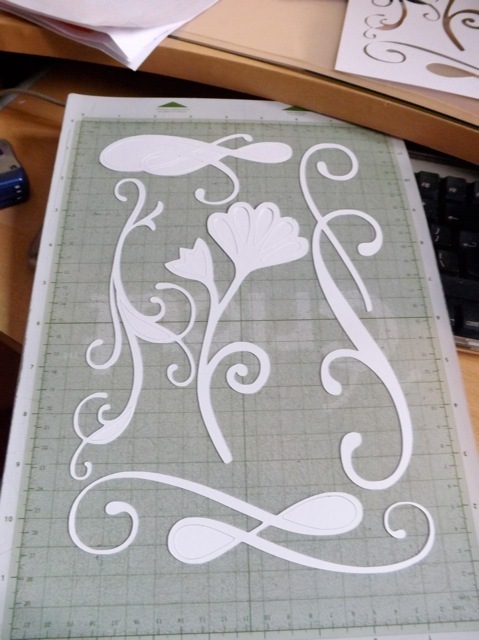 If you cut if from fairly heavy cardstock, as I did, you should be able to easily use it as a stencil, either for spray inks or modelling paste. As it isn’t washable, with paste I just scrape it really well – so long a there is not clots of paste that harden on it, you should be able to use it again and again. And if it does get ruined, just make sure you save the project in Craft Room and you can quickly cut another at a later date. And again, easy to repeat that and scatter the ovals across the page. 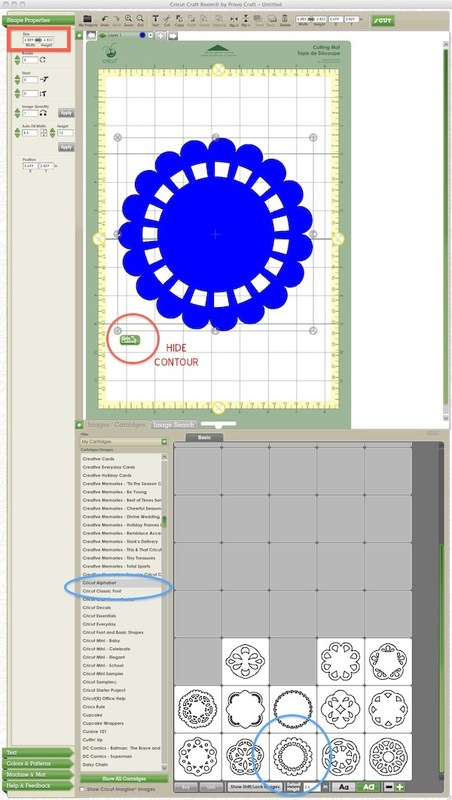 The point is you can easily design unique-to-you tools for use in your mixed media projects. It’s just a matter of looking at the images you have available to you and considering how you can adjust them to suit your purposes. 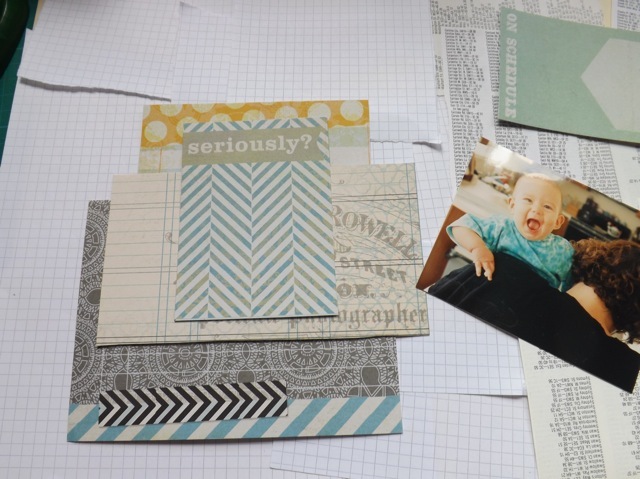 There are SO MANY images available via Craft Room and the ways you can alter them are endless. 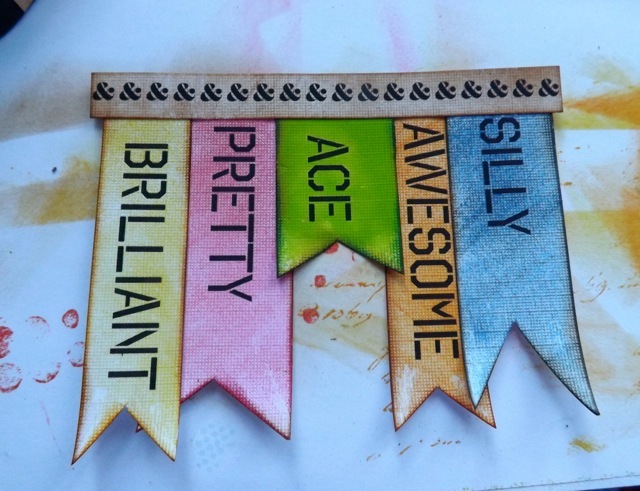 Categories: Cricut Craft Room, Cricut Mini, stencils, tutorial | Tags: Cricut Mini, how-to, Stencil | Permalink. Then I had to pop out for the school run (and am just about to leave for the pick up then ice skating) but in the meantime I got most of the plan for the completed page sorted, some of the elements created and arranged, so it’s just sticking it down now. 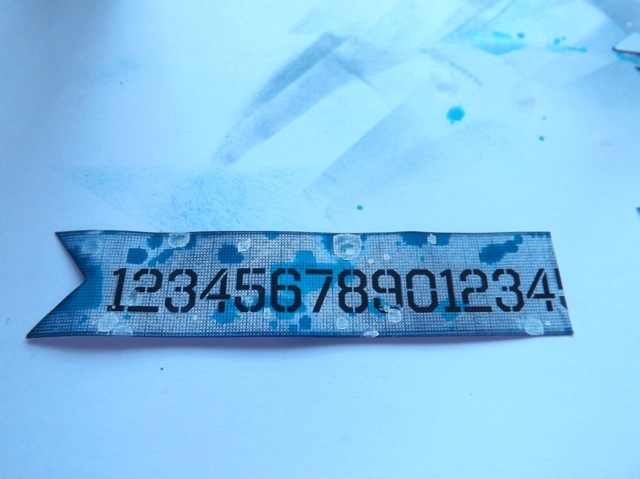 The number strip was one I cut, as are the little chevron bots, and the title was from my sheet of prints. 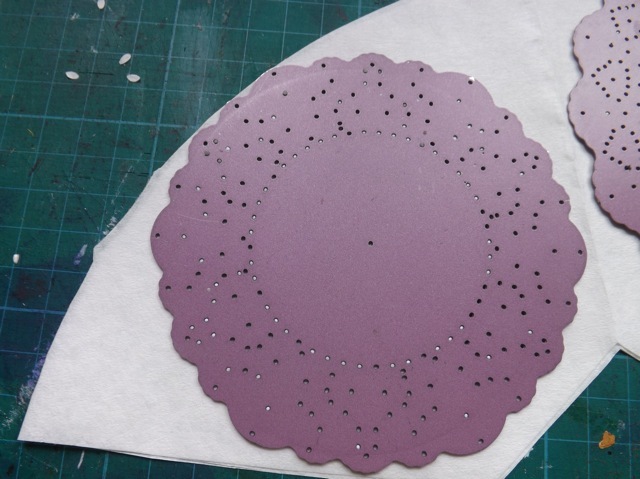 The coffee filter doily was cut with the Cheery Lynn die I showed yesterday and I did find the brown filters, so you can see they DO produce a “kraft” coloured doily and I look forward to using them at some point, although not on THIS page. Heard back from DH too, with the good news that the planned WOYWW crop, although conflicting with one of his chili cook-offs, shouldn’t be an issue. Phew. 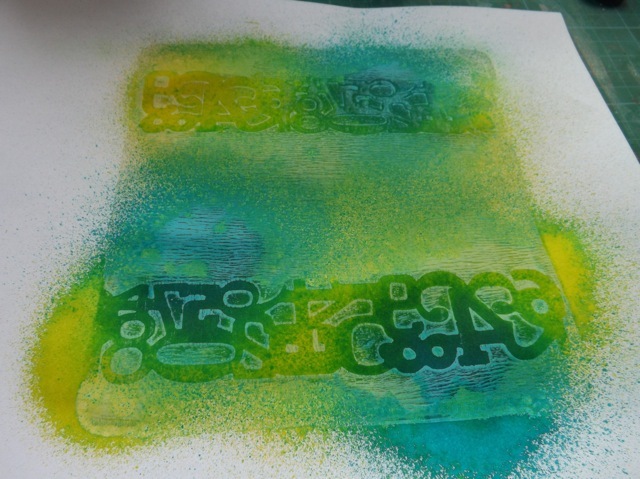 Now I just need to be thinking about my ATCs….. How did it come around so FAST?? I’ll possibly not manage too many visits today but will hope to meander around the desk-list over the next few days. If you watched the video I embedded yesterday you will have noticed a little doily was part of her cluster. Now, I am not much of a doily kinda gal, I have never intentionally bought them (although have had a couple sent as part of a kit I once got) but I did like the softness they added. I wasn’t about to go buy them, figuring I might not actually use them – I have a bad habit of slightly obsessing over something or another then go totally off it in a flash. I might go off the idea of using a doily AFTER I bought a huge pack of them, who knows? So I cast my eye around my cluttered craft room and it landed on my pile o’ coffee filters. 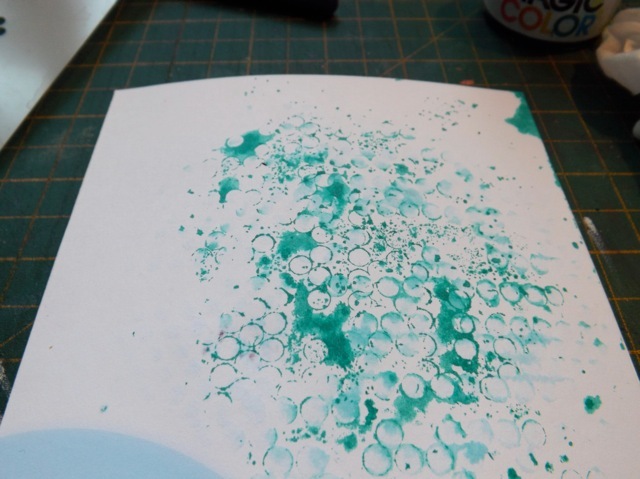 One of the things about doilies is the texture of them – plain old printer paper, or even light cardstock was in no way going to give the same effect, to my mind. But coffee filters? – yeah baby! 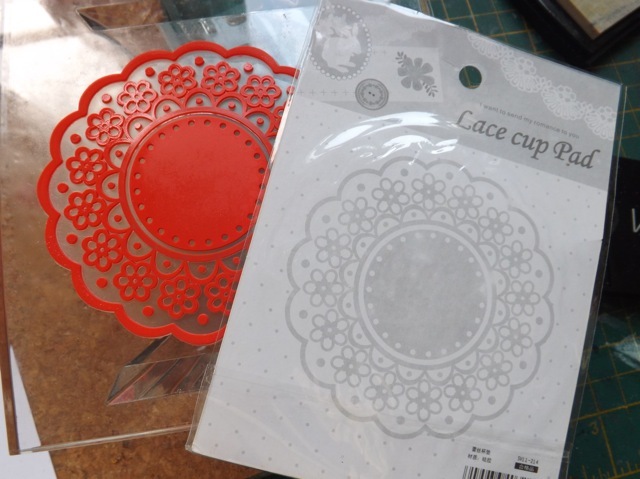 I have two Cheery Lynn dies that look pretty much like traditional doilies. One is about 4 inches across and the other about 5 inches. First I trimmed off the bumpy area and then opened them out. The 4″ inch one, shown below, JUST fits these filters and the 5″ one fits enough to make it worth cutting – I cut 3 or 4 layers and they cut well using my Grand Calibur and the round shim I made for these dies ages ago. 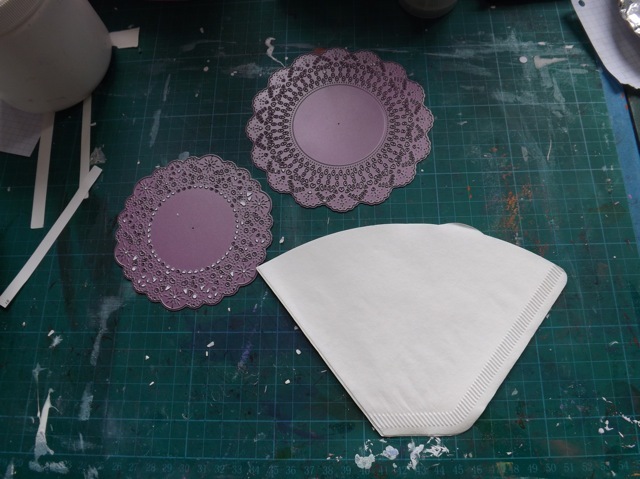 The absorbent coffee filter takes spray ink nicely, like a “real” doily would, and works well enough as a mask too – see it there to the side? But what I really think is cool is using the brown (we say Kraft!) coloured coffee filters to make kraft coloured doilies! Nifty. Unfortunately I’m all out of brown filters (or DH ran out of filters at the office and took them there) but I know you can imagine them. Brown doesn’t work for this particular cluster but I am anxious to try it. And DANG! I was JUST at the store…. Ah well…. 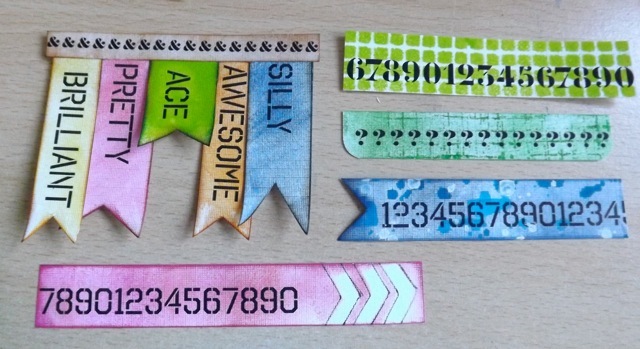 Categories: die-cuts | Tags: how-to | Permalink. 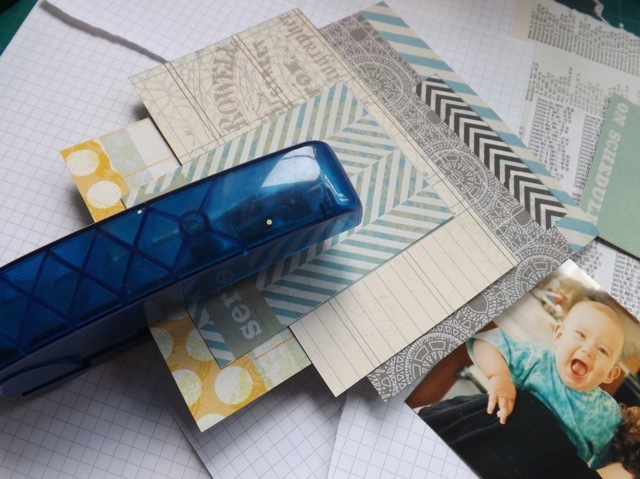 A great little trick …. As a result of al that I haven’t made anywhere NEAR the planned progress, but I did discover a little trick that I thought I would pass on. I am SO doing this all the time now! 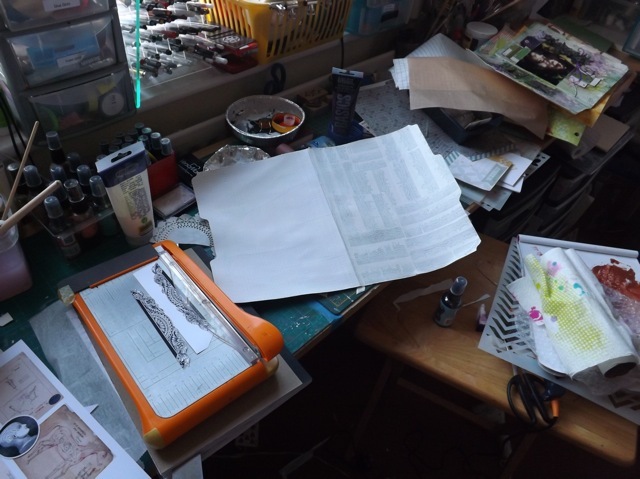 When I am making a layout, be it traditional or mixed media, I always layer and cluster piles of things. Laura, from crop, calls me the Queen of Layers. Not sure that is true, there are others who do it way better than me, but I will acknowledge it is def. part of my style. Problem is I am always shuffling things around and I often get it all set up perfectly then when I come to sticking it all down I get a piece turned around or something out of order and then I look at the final result and slap my forehead and go DOH! WELL, a simple staple is all that is needed! This keeps everything as you want it to be, but the edges are all still free, so you can easily slip other layers into the gaps and play around with them to your heart’s content without losing the basic structure of the cluster! Isn’t that genius? 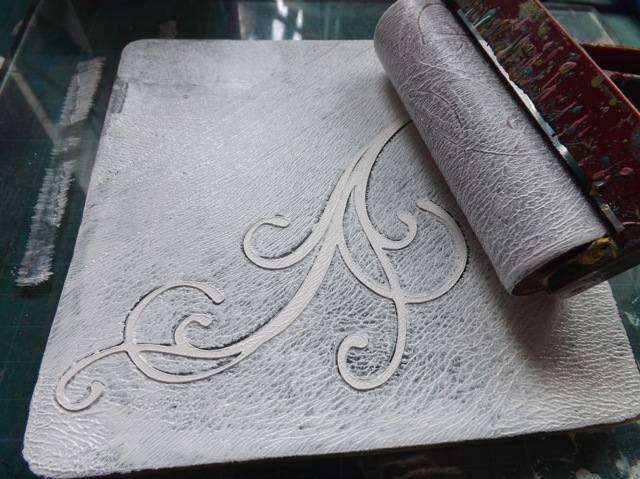 I find that the base is not going to be something I want to shift – once the photo is on top I’m happy with the overall SHAPE and it’s just slipping in a strip of this, a label or tag end of that, etc. OK, so it isn’t this A May Zing technique, but it is one of those super nifty little tricks that just make the process so much easier. And if I WERE to change my mind, there is only one staple to remove to free it all up again. As you can see I have the next folder ready for its base of paper, before I start building in the colour with inks and sprays and paint and stamps and masks. I may try to get all that stuck down before dashing off to collect DD so I can begin work in earnest in the morning, but not sure I’m done with sorting out the insurance stuff quite yet so it may have to wait. Poor DH. He leaves town for a few days and CRASH BANG WALLOP – so typical. Just thankful if there was a car accident in the cards, it was one as minor (albeit annoying) as this one and not something far worse. Thanking my lucky stars…. Categories: scrap related, tips & finds, Uncategorized | Tags: Layouts, scrapbooking | Permalink. Very excited! 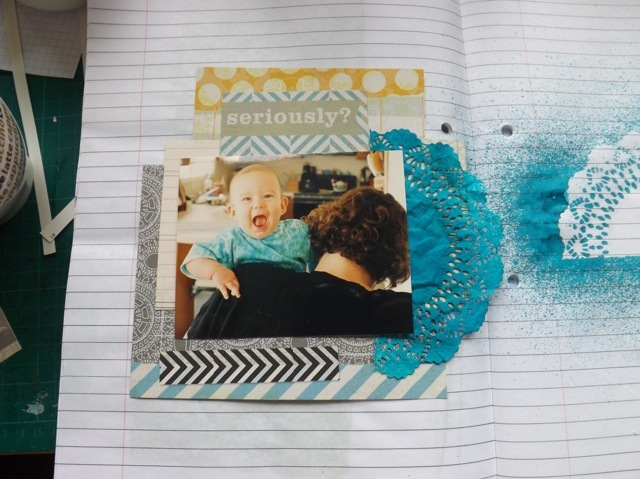 I tried doing a mixed media layout on one of the file folders but using the whole surface for a “double page” spread. At first I thought I might try crossing the centre divide with the photo but as it will fold, I am not sure that will work as well as it does with the single pages, as with a traditional 2 x 12×12 layout. In the end this is what I came up with. 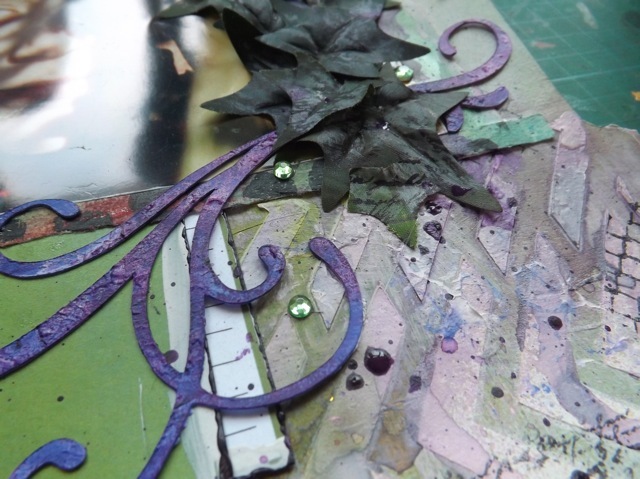 I managed to use mostly some scraps, a Gelli print, some of the cut and gesso-covered swirls and some fabric ivy I’ve had kicking about to ages. Love how the swirls turned out, although the colour here isn’t as bright as it should be. 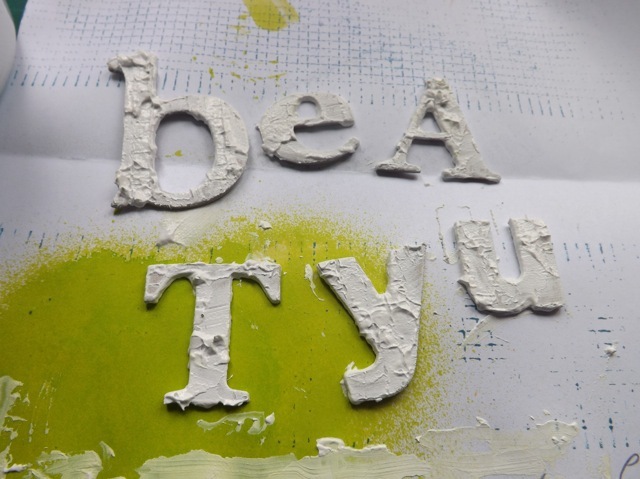 Can you see I dry-brushed some Gesso onto the ivy and stamped over it? Here is a better shot of the swirl. Again, it’s hard to see but I edged the papers first with a smudge of Gesso, then a thick application of a deep violet paint. See how crusty it looks? 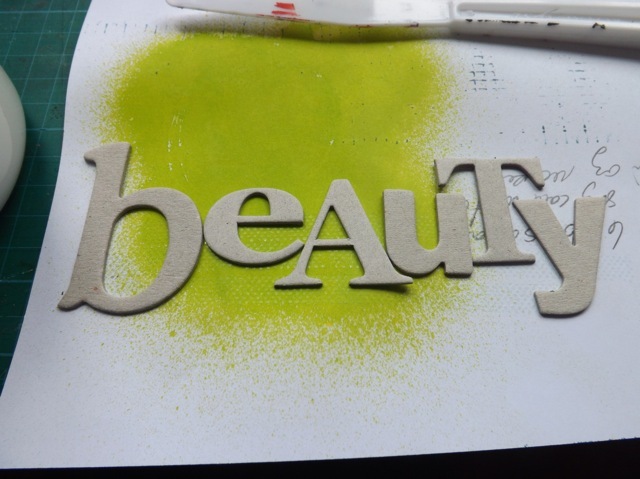 I did the same with the chipboard stencil letters. Now I need to weigh it down to make it as flat as can be, then test the back-to-back sticking. Wish me luck! I sure hope it works out like I hope it will…. 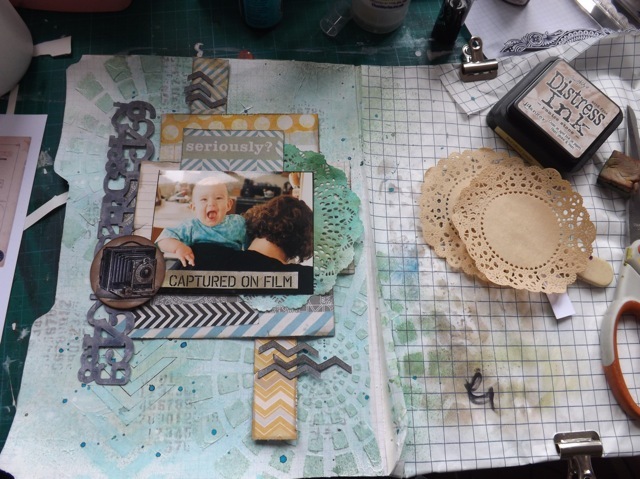 Categories: mixed media, scrap related | Tags: mini-albums, mixed media, scrapbooking | Permalink. I often start something without a clear idea of the final outcome. I mean I have an IDEA, but not a vision of the final piece. 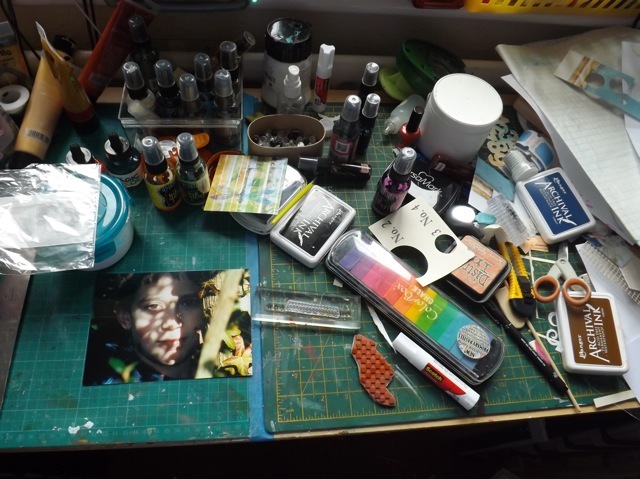 I tend to riffle thru my stash and the debris on my desk and that leads me where the piece wants to go. Problem is I have a LOT of stuff, but I never seem to have EXACTLY what I see in my head. 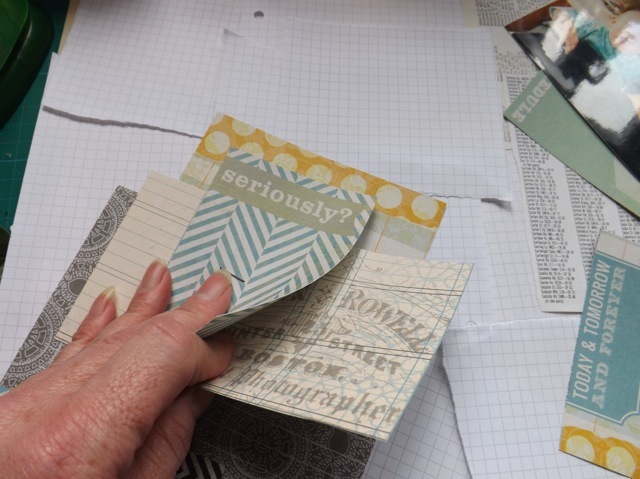 For example, I like embossed resist papers – I don’t own a single one. I love big swirls, but I’ve pretty much used up all the chipboard ones I’ve acquired over the years. When I think Oh that would work there… I am then too lazy or too engrossed in the process to stop, switch gears, and make something specifically for the piece I am working on. And my pockets are just not deep enough to buy everything I would like to have on hand. Thinking about stuff I wish I had, I thought I would take a day and MAKE things that I know I will use, get them all ready to go and then when I think a lovely swirl will fill that space perfectly… I just grab it. So I did two things. First I grabbed lots of plain white heavy cardstock. 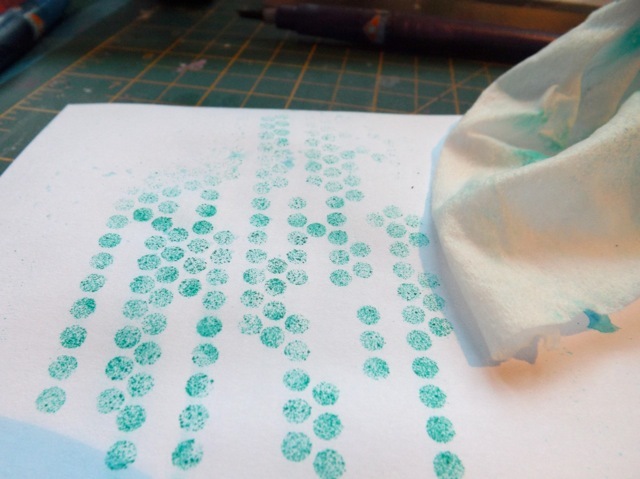 I stamped a bunch of border stamps and embossed them with white embossing powder. I made a couple of sheets, mixing up thin and fat borders. 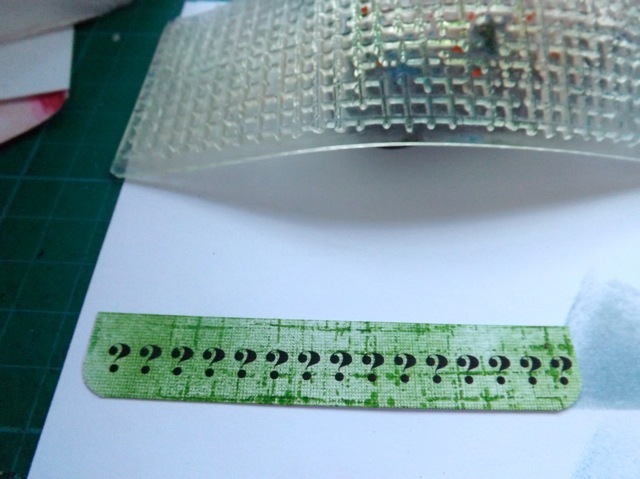 Now, when I am layering up clusters of papers and embellishments, and I think a little embossed resist strip will add just the texture I want, I only have to grab the sheet, cut out one, spritz with a bit of ink to match…. 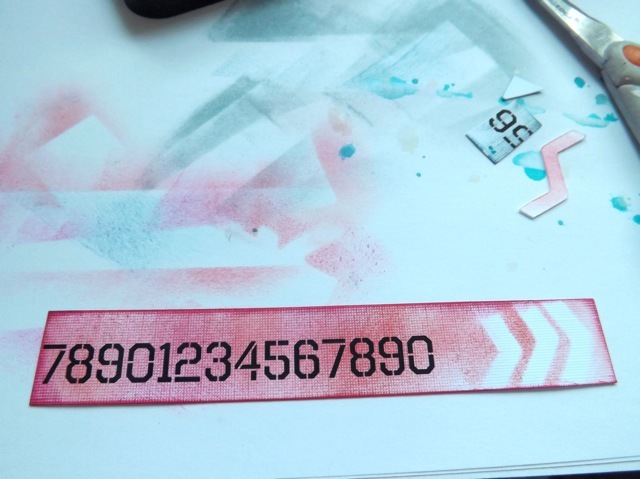 then maybe stamp over it with some Distress ink. 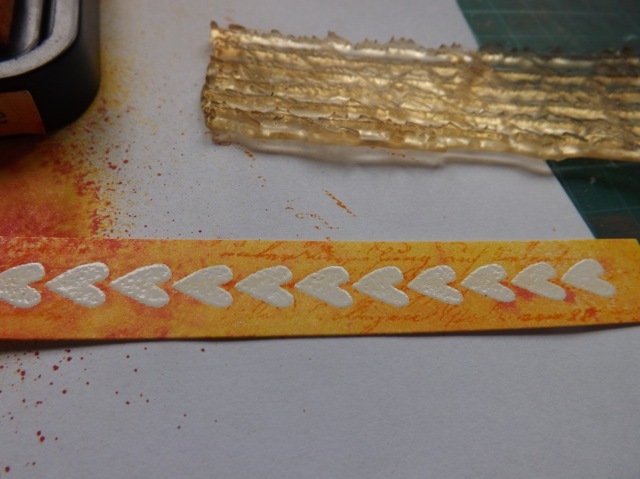 That whisks away from the embossing, and the strip is ready to tuck into a layered group. 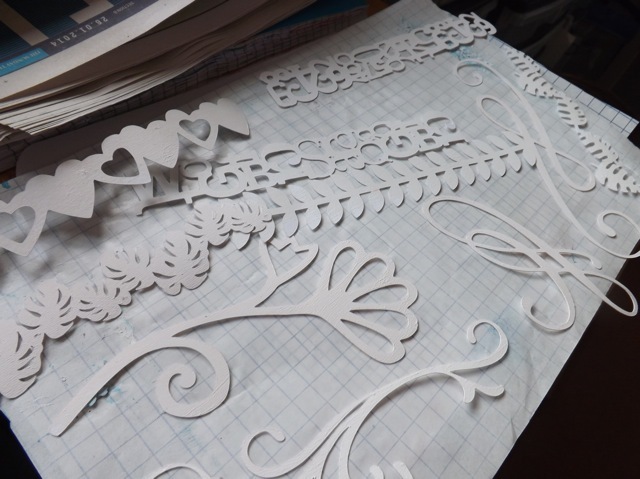 For a selection of swirls and some die cut border pieces (if I want more texture) I went to my Cricut mini and Craft room. I figure as long as I am cutting, why not make a morning of it? LOL! I set up the mat and went crazy. I also did a mat of borders and one of banners. 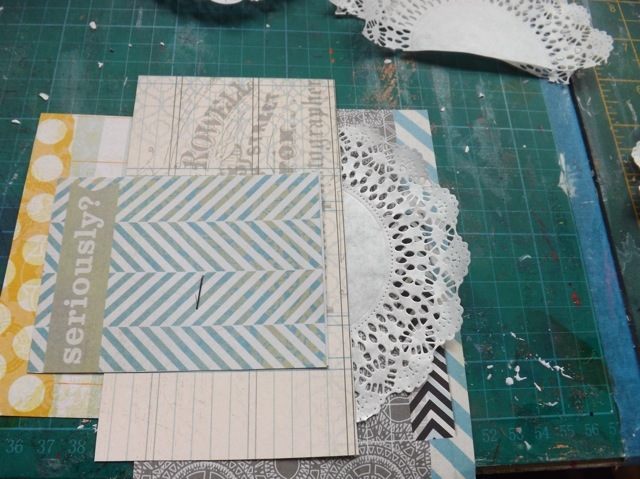 Then I thought to myself should I cut two of each to stick together, for a more chipboard-like piece? When I mist or ink or paint these they are going to droop and flop, even out of heavy heavy card. I had an idea. A bit like the acrylic medium technique for sealing things, I thought why not seal them with a coat of Gesso? It will give them a little more body and then they will be ready for adding to mixed media style things in my file folder book. 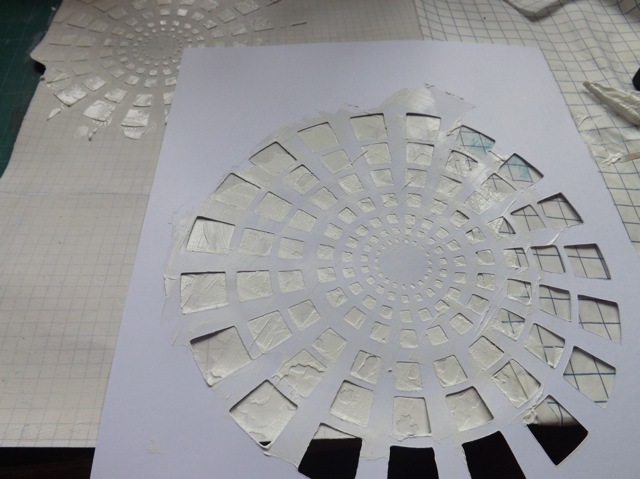 I brayered the Gesso on to the Gelli plate and laid on the piece – yes, I know the bigger plate would make more sense, but the small one was what was on my desk. Told you I was lazy…. Brayering over the back coated both sides. In the end I had a stack of them drying. I didn’t waste the Gesso either. 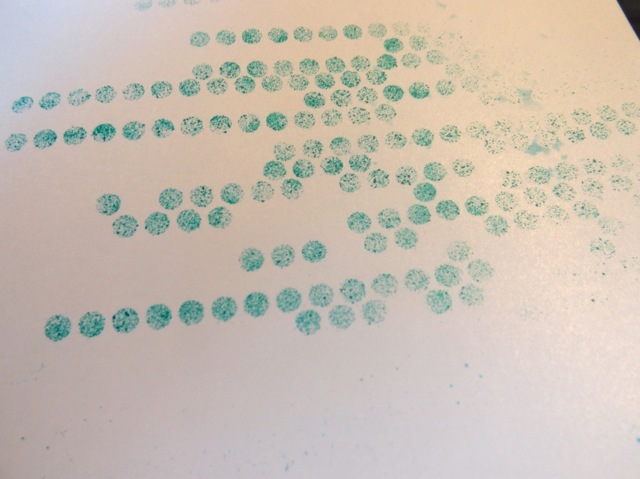 I pulled a print off the plate and used the spray inks on it. Cool. And I still have the waste from the cut-outs. 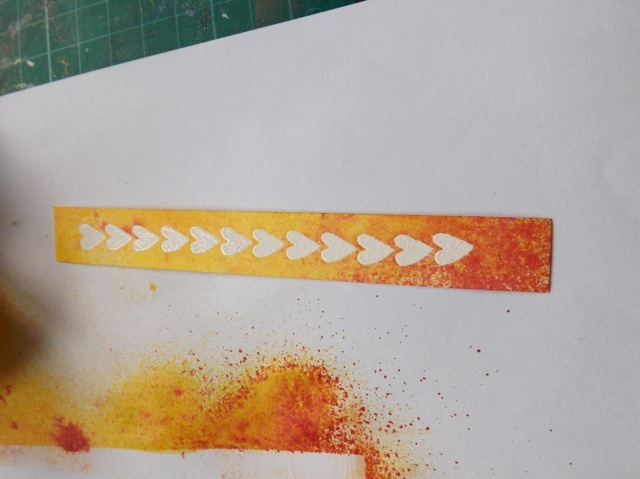 They will surely work for stencils and the cardstock is thick enough they will work with modelling paste as well, at least a few times as they are in no way washable! 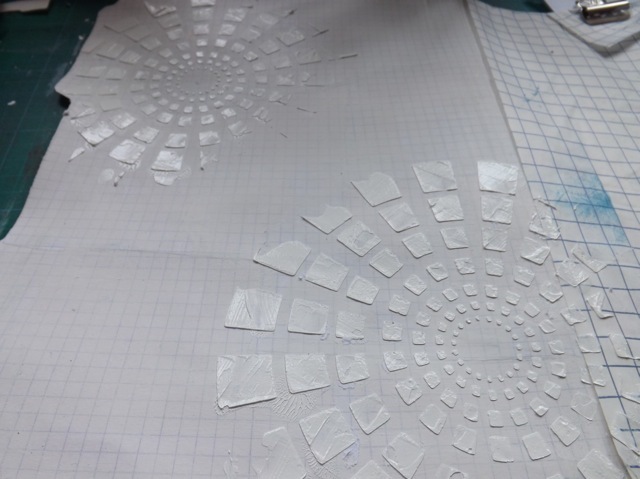 Oh and I forgot to mention…that doily sort of thing on the embossing sheet? That is actually a cup coaster! 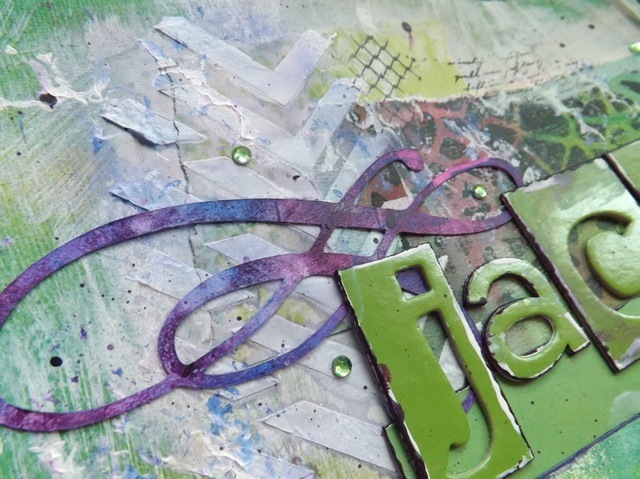 Categories: die-cuts, mixed media, New from Old, stamping | Tags: art journal, Gelli plate, how-to, scrapbooking, stamps | Permalink. Yesterday turned into the day from hell. 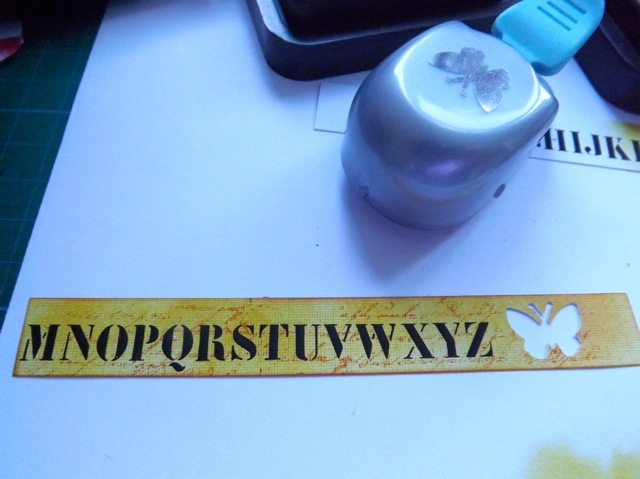 I made the mistake of trying to clear a bit more space on my desk, which lead me to look at my super-messy stencils and stamps and think they needed cleaning. And that led me to the chaos of my stamps in general, then to the pile of need-to-mount stamps, and…you get the picture. Add shopping and skating and some time with DD and it was a fairly non-productive, craft-wise, day. I DID do the title for the last page. I love how it turned out. 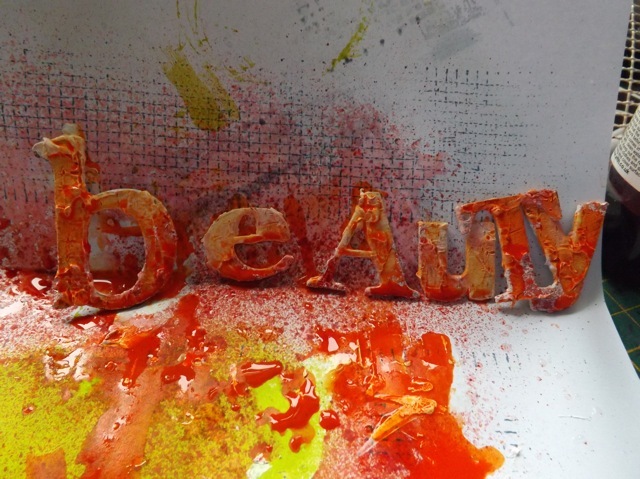 I first picked the word from a bag of random chipboard letters and stuck them to a bit of paper. 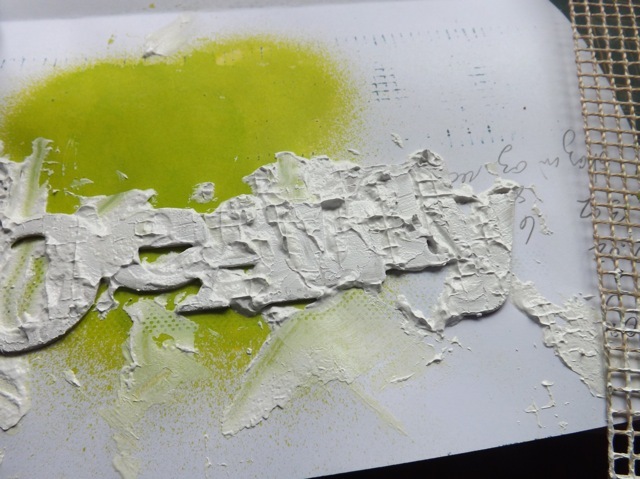 I smeared on some modelling paste then pressed a grid into it. and stuck them on. Yummy. I think it really balances and finishes the page off nicely. It MIGHT benefit from a bit more ink or spray ink under the title but I’m not sure. I may think on it…. Now a few WOYWW return visits to finish up then on to the next one. 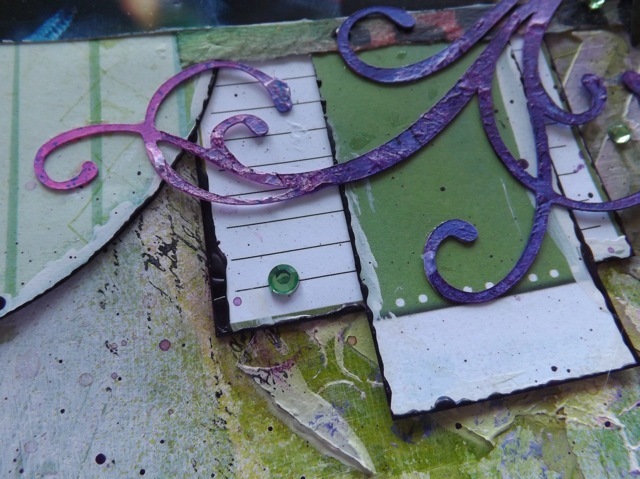 Categories: art, mixed media, scrap related | Tags: art techniques, mixed media, scrapbooking | Permalink. The chaos on my desk is unreal. But pretty standard so far as WOYWW goes LOL! The mixed media remnant cover it, but I’ve cleared a space and picked out my next photo! I have to finish the title on the last page then this one is the one I will attack next. Looking forward to my visits this week – I always find such inspiration!